In 2017 alone, counterfeits worth $1.6 trillion were sold, which means a tremendous amount of revenue was snatched from the rightful hands. In 2018, counterfeiting is said to have become the largest criminal enterprise, leaving human trafficking and illegal drug trade behind. These facts may give you a glimpse of how big the counterfeit problem is. As soon as a product starts gaining popularity among the shoppers, it’s counterfeit products begin to sprout in the market. The good news is, now you can save your brand from counterfeit problem forever. NeuroTags provides cost-effective and foolproof Anti-Counterfeit solution, which is very easy to deploy. 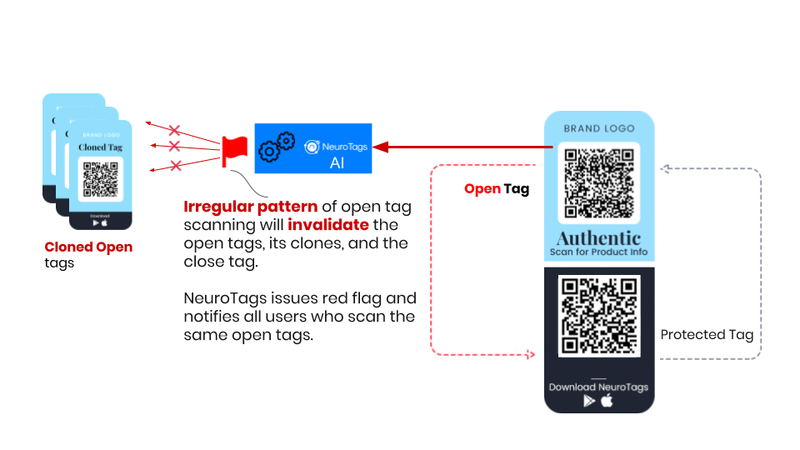 NeuroTags tackles the counterfeiting problem with the help of its crypto tags – A pair of tightly coupled tags. NeuroTags provides a tightly coupled pair of tags. These tags are algorithmically linked with each other. 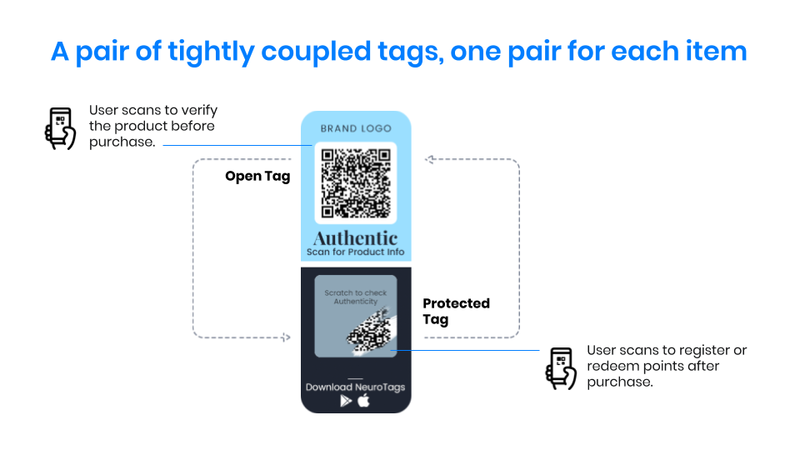 One tag couple forms one crypto tag that consists of – Open tag and Protected tag. A user scans the open tag to verify the product with a fair amount of certainty before purchase. A user scans the protected tag to check the authenticity and register or redeem points after the purchase. Each tag is unique. If someone tries to copy the tag, he/she can only copy the open part and can never guess its associated protected tag. To copy both open and protected tag, the counterfeiter will have to buy the original product, and even then maximum one tag can be copied, and it too will be logistically unusable, as the protected part is locked after first use and it also locks the corresponding open tag. All the cases of “if and else” conditions lead to non-usability of copied tags (please refer the pictures below for more explanation), which will make any counterfeiter to not venture into your products zone. The protected tag is hidden and can be opened only after the product has been sold. The buyer scratches the protected tag and scans it. 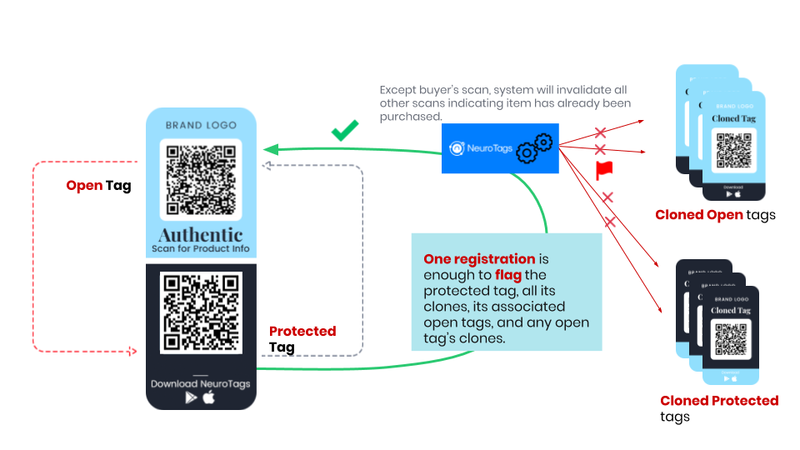 As soon as this tag is scanned, the status of both open tag and the protected tag is updated at NeuroTags cloud, and the respective product is marked as sold. Now, this protected and open tags codes are registered to the buyer of the product. When an open tag is scanned, and this tag’s code is not marked as sold, then the buyer is routed to the product’s landing page containing the product features and other related information. If the tag is marked as sold then the user is shown a page saying that the product has already been sold. Now, here two possibilities arise. Either the owner of the authentic product is scanning the tag, or the open tag has been copied and applied on a fake product. If a new buyer sees the message that the authentic product has already been sold, then she/he immediately knows that the product in front of her/him is not genuine. So they can report the fake product using the option provided on the same screen.